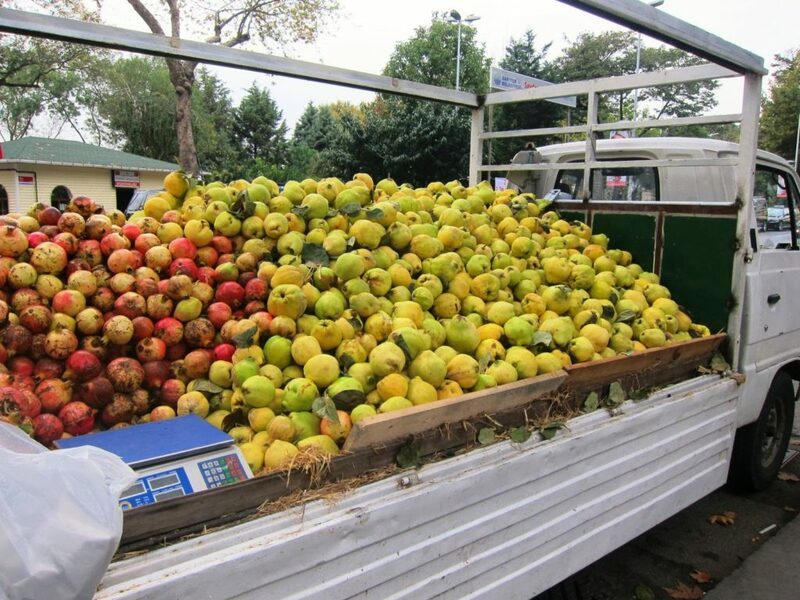 When I spied a recipe with a similar picture way back in July, I mentally earmarked it for now, when the quinces and pomegranates are in abundance here in Istanbul. Coriander is something of a rarity here but not totally impossible to track down. I do love the flavour. Because it’s not commonly used, I love it even more. 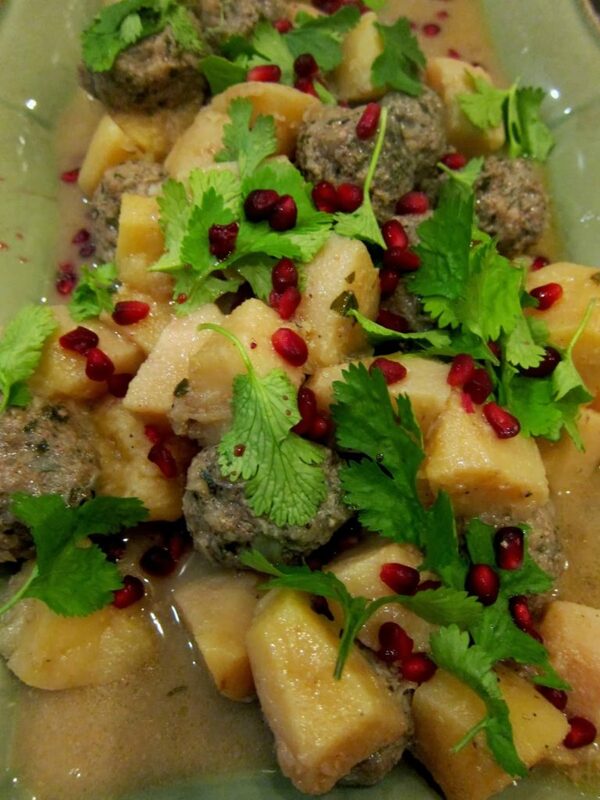 And as for the pomegranate seeds, I used the ones I froze a couple of weeks ago – another great usage for them! How about this for abundance of both pomegranates and quince? Spotted in Yeniköy. These quinces are as hard as bullets but peeling them with a good vegetable peeler makes the job much easier. Getting those cores out is a bit of chore but has to be done. You need the knife for this. The recipe (from Ottolenghi if I dare say so), says they can either be stuffed ie each half filled, but I think these Turkish quinces are just too big – two stuffed halves would be enormous for one person – or simply chopped as I have done. You need the knife for this. The recipe (from Ottolenghi if I dare say so), says they can either be stuffed ie each half filled, but I think these Turkish quinces are just too big – two stuffed halves would be enormous for one person – or simply chopped as I have done. Ottolenghi actually says: ‘This is a stunning dish that we always go back to’. I think so too! The aroma in the kitchen while it cooks is simply divine. The finished dish looks fabulous when you bring the platter to the table what with the bright green of the coriander contrasting so sharply with the jewel red of the pomegranate seeds. 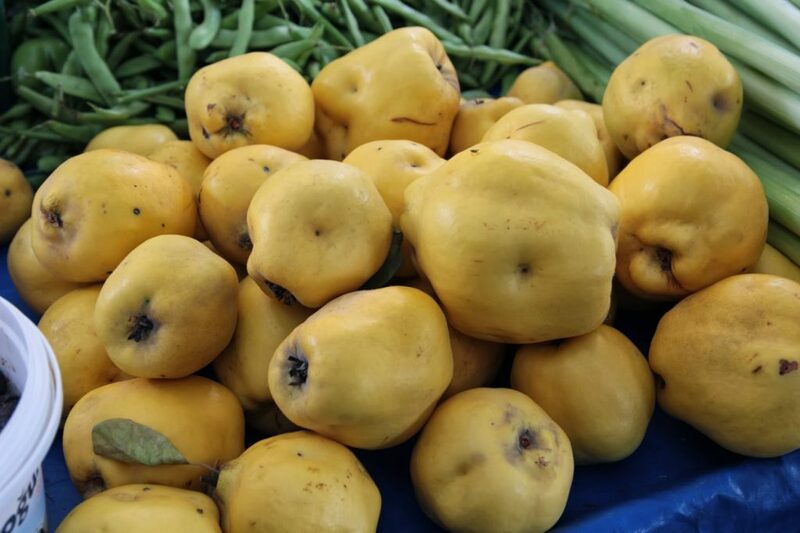 Let’s face it, the quince and sauce alone would look rather dull without their addition. 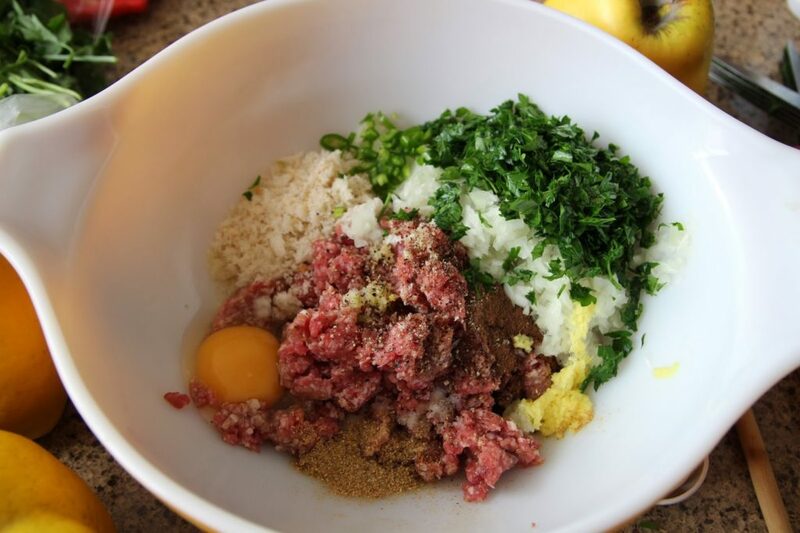 Place the lamb in a mixing bowl along with the garlic, chilli, coriander, breadcrumbs, allspice, half of the ginger, half of the onion, egg, 3/4 tsp of salt and some pepper. Mix well with your hands and then form into meatballs the size of ping pong balls. Peel the quince and halve them lengthways if stuffing them. 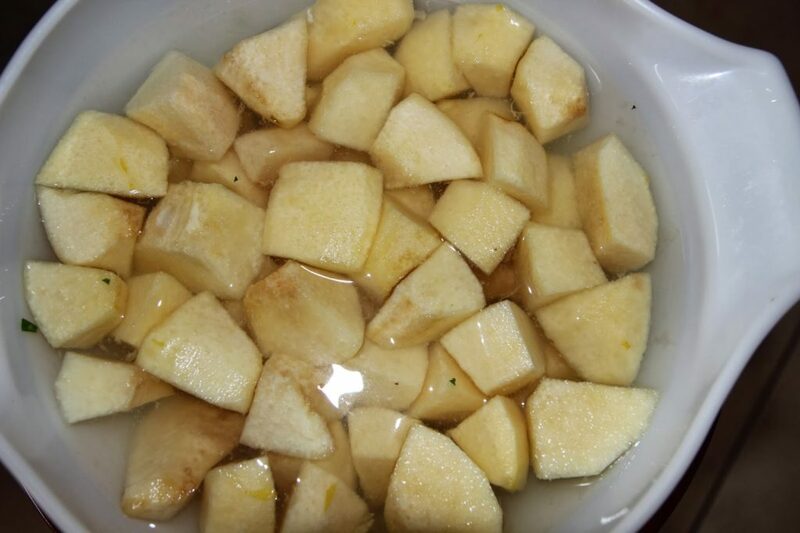 Keep them in a bowl of cold water with a squeezed half lemon so that they do not turn brown. Remove the pips and core. Use a small spoon or melon baller if you are going to fill the halves. Fill the hollows with the lamb mix, using your hands to push it down. If you are not stuffing them, simply chop into chunks before placing them in the acidulated water. Heat up the olive oil in a large frying pan for which you have a lid. Place the remaining onion, ginger and cardamom pods in it. Sauté for 10-12 minutes, until the onion has softened, then add the molasses, 1 tbsp of lemon juice, sugar, stock, ½ tsp of salt and some black pepper. 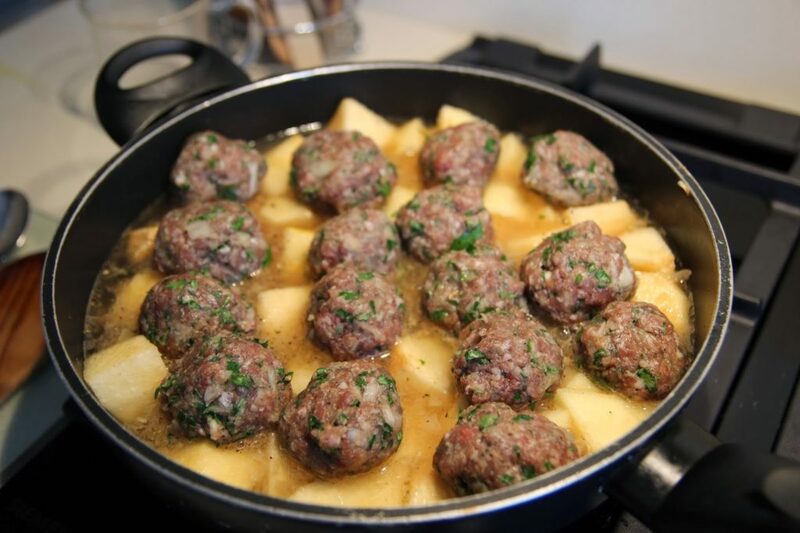 Add the quince chunks with the meatballs resting on top, or the meat-stuffed halves with the meat facing upwards, reduce the heat to a gentle simmer, cover the pan and cook for about 30 minutes. At the end the quince should be completely soft, the meat well cooked and the sauce thick. Lift the lid and simmer for a minute or two to reduce the sauce if needed. I had to do this for an extra 15 minutes! I’m not sure whether it was because the quinces were extra juicy or what but the amount of liquid certainly increased. 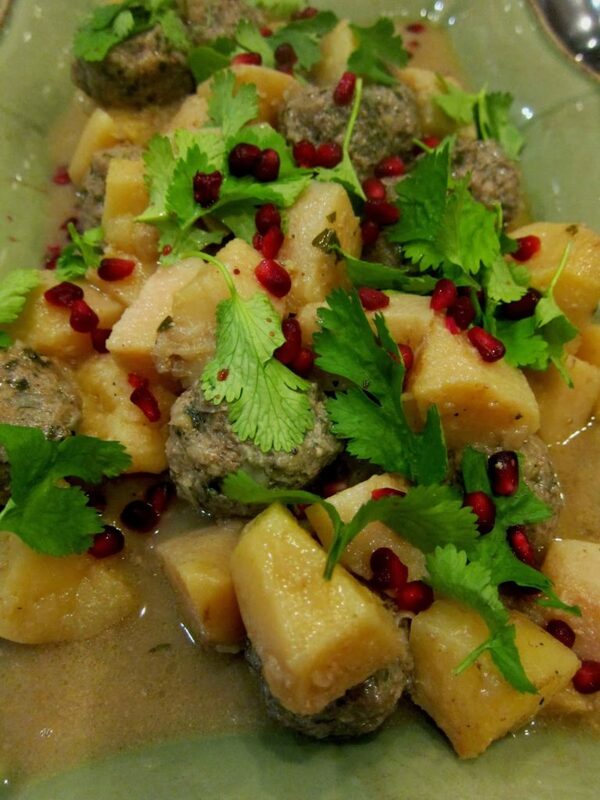 Serve warm or at room temperature, sprinkled with the coriander and pomegranate seeds. 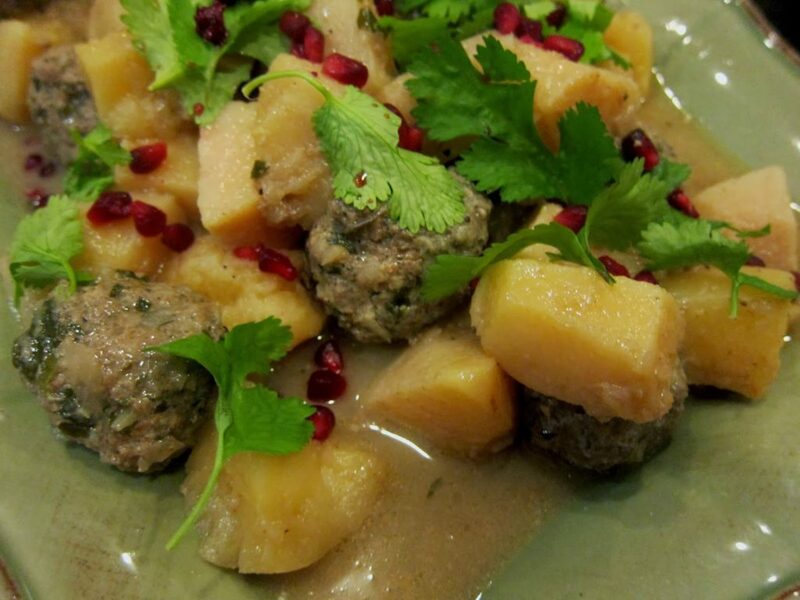 You might find it interesting to compare this recipe with a more authentically Turkish one I did almost two years ago using lamb and quince. A word of advice from an old-timer: the combination of fruit and meat doesn’t go down very well on the whole here, nor are sauces popular. This is why you’ll find that fish in Turkey is usually just grilled or baked, and meat is meat. So while personally, I was thrilled with the way this recipe turned out, be careful who you serve it to.